Fountain Valley, CA – March 7, 2017 – Kingston Digital, Inc., the Flash memory affiliate of Kingston Technology Company, Inc., the independent world leader in memory products, today announced it is shipping Data Center PCIe 1000 SSD (DCP1000). DCP1000 SSD is a Flash-based data center technology solution that aggregates four 8-channel controllers together to deliver up to 1.25 million IOPS from a single SSD. It can help IT professionals easily and economically scale performance and increase storage capacity in data centers without replacing an entire server infrastructure. DCP1000 SSD is currently shipping in the U.S. only. 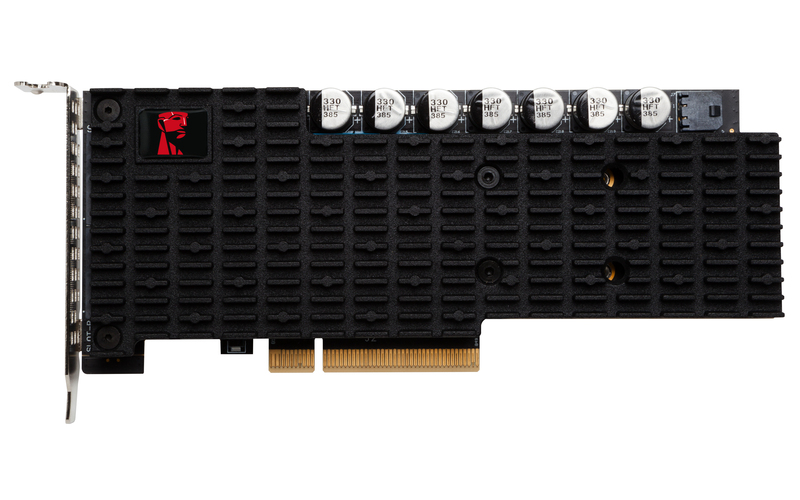 The PCIe-based NVMe Gen. 3.0 x8 SSD is targeted toward high-performance data center applications such as database optimization, online transaction processing (OLTP), software defined storage, virtual desktop infrastructure and virtualization. Organizations that engage in high-performance computing (HPC) where workloads are compute and data intensive will benefit from the 7GB/s throughput and high IOPS that the solution delivers. Additionally, DCP1000 SSD delivers high sequential performance so it’s the perfect drive for industries that push out large amounts of streaming data. DCP1000 SSD is a result of a close engineering partnership with Liqid Inc., a provider of on-demand composable infrastructure (CI) platforms, enabling hyperscale agility at any scale. It will be demonstrated in Liqid’s booth (booth #A13) during this year’s Open Compute Project U.S. Summit 2017 (OCP) March 8-9 in Santa Clara, Calif.
DCP1000 SSD features hardware-based pFail, next-gen. ECC data protection, advanced error correction and advanced device monitoring. It is backed by a limited 5-year warranty, free technical support and legendary Kingston reliability. For more information visit www.kingston.com. Extreme data center SSD performance: DCP1000 features ultra-fast PCIe Gen 3.0 x8, making it ideal for data centers requiring extreme performance. Outperforms legacy architectures: DCP1000 delivers impressive performance with an ultra-low transactional latency. High capacity: With up to 3.2TB1, DCP1000 is a high-capacity NVMe solid-state drive. Power failure protection: DCP1000 offers enterprise-class power failure protection to maximize uptime. 1 Some of the listed capacity on a Flash storage device is used for formatting and other functions and thus is not available for data storage. As such, the actual available capacity for data storage is less than what is listed on the products. For more information, go to Kingston’s Flash Memory Guide at kingston.com/ flashguide. 2 Performance varies by capacity. Combined performance measured across (4) physical drives. Based on Kingston internal testing using SNIA Solid State Storage Test Specification Enterprise v1.1. 3 Average latency measured using FIO v2.15, 4KB random I/O at queue depth 1. 4 The total endurance of (4) physical drives.